I’ve got to say that the dressing room that they have here is very impressive. It’s rare when you’re going into a place where everyone is so welcoming toward you. It’s a great bunch of boys here and everyone gets on really well here together. It’s kind of like one unit, and from my early impressions like a family. He found out there is a lot of travel, and he’s fine with that. He seems to really like Philly, so hopefully Philly will like him, too. Kevin Kinkead has some good quotes from Simpson about his role in the Union system and the positions he’s played in the past. If you missed it, Matt De George hopped on the KYW Philly Soccer Show pod to talk Union this week. The Goalkeeper sets up an unnecessary straw man (who ends up needing to be silenced by his creator) in order to discuss the growth and aims of academic side of the Union’s academy. There are interesting quotes from Richie Graham, who says that the academy is looking to “increase the total size of the pool of players that are getting developed.” Though The Goalkeeper argues this is an indisputably positive goal, it’s worth keeping in mind that there should likely be a balance between quality and quantity. Soccer at the highest level for elite kids is all about decision-making and creativity and synthesis and analysis, and that’s what the highest-level teaching is – it’s not about recall and listening to the coach and the teacher and getting the basic information. It’s higher-level thinking. So to be able to intersect those two pieces is a really cool, amazing thing to do, which I hadn’t been challenged to do in the past. So does that mean the academy is officially about only soccer but has an implicit focus on academics? That seems like the wrong takeaway based on the rest of the piece. 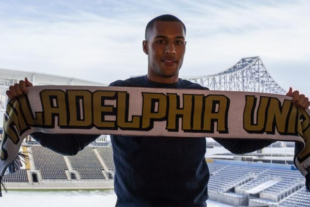 ICYMI: Section215 looks at Santi Moar: Union draft pick and Bethlehem Steel striker. Sunil Gulati spoke about why pro/rel is not a thing in US soccer. There’s two images when you think about New York that maybe come into play for people here, and they’re both downtown around New York harbor,” he said. “One is the memorial from 9/11, which still is in a lot of people’s minds and raises security concerns where it’s not a question of whether they’re rational or less rational, but those are concerns for people. So security is obviously something that’s very important to us. Obviously, the other major image is that poem on the Statue of Liberty. I think while there’s always a balance between those things, everything America stands for in terms of openness, in terms of being welcoming, is challenged by such an executive order. It’s going to be challenged and has been challenged successfully already in courts. And my guess is you’re going to see modifications in that. So it doesn’t represent what I believe is the best of us. My guess is some years from now a lot of people will look back at this and say we shouldn’t have done that. I always use the term ‘equitable pay.’ What is fair. And I have no doubt we’ll come to an equitable agreement with the players. There are so many differences in the agreements now in some of the benefits that the women’s players get and some of the benefits the men’s players get. There are differences in revenues. All of that will be part of the discussion. The men don’t have guaranteed contracts year-round. The women do. And it’s for a very important set of reasons. Also, the US development academy is expanding. How many do we have now. Less than 100, but you have to weigh the raw number of kids against the resources the Union have as well, which are likely far fewer than an EPL club. 78 in an earlier Tannenwald article about the Academy. Jim Pierce of the Academy classroom staff told me 75 in December, he said 15 were from FC Continental Delco, or whatever the proper order of their name now is. By inference the rest were the Academy . I did not puch for clarification at the time. Looks to be in the 130 range based on the rosters listed on the Union website. Good call! I was using the number of students in grades 8-12 cited in the linked article above. Can we all take a moment to appreciate the comment by Jay Simpson about how MLS style likes to keep the ball on the ground and is less direct than English football. But also remember the context – he has played the majority of his career in the lower leagues. From the limited viewing I have had of those games, it did seems more direct and more…”classical soccer” I guess. Very true. He was definitely talking about League 1/2 and probably the Championship regarding some teams. Or any team coached by Sam Allardyce. Knock down job. Thank you. Curious. What of the investors who bought into the system when the possibility of a pro/rel model was on the table. Its only been since 2012 Mr. Garber changed the narrative. That’s all. Thanks. Exactly. The decision was made to never have pro/rel. They are constantly being badgered to do it, so they just placate the public. It was never going to happen. You can’t have a pyramid scheme model set up, and allow certain teams to fail. Everyone has to pay to play and keep earning that money. At this point, the option of it ever happening is so far away, it’s pointless to even think it ever will. “So does that mean the academy is officially about only soccer but has an implicit focus on academics? That seems like the wrong takeaway based on the rest of the piece.” – Cann immediately below Tannewald. From my opportunities at the YSC Academy open house in November, from my formal visit there in December, and from several conversations I have had with Dr. Ahmed-Lee since, including a lengthy one about Matt Real finishing his high school diploma, I agree with Adam that the “clear sense of responsibility for those who don’t [make it to the pros]” is the stronger emphasis at the Academy. Yes, everybody there knows of the likely candidates for practice with the USL’s Bethlehem Steel and they are excited about them, quite. But the atmosphere, structure and admissions policy is overtly college preparatory. Not only is there Mr. Graham’s quote that I have cited twice before that it is “actually irrelevant” when an Academy boy goes on to the pros. Consider also that Dr. Ahmed-Lee has three Philadelphia area college preparatory schools in her curriculum vitae – Penn Charter, Chestnut Hill Academy and Shipley – in addition to her earlier work in Washington state. The classes I attended were all recognizably college-preparatory. The faculty with whom I have chatted display that level of intellect. The school’s academic philosophy is overtly designed to inculcate the personal skills necessary to overcome disadvantaged backgrounds. I have never had the privilege of interviewing Richie GRaham. But I imagine he is trying to create a soccer academy that will become self-sustaining at some point long down the road. To become that his school has to appeal to a wider clientele than just the few truly elite potential pros. His educational philosophy, whether intentionally or not I cannot judge, seems broad enough that the school might become able to support itself at some point in the future. If by acts of generosity and diligent fund-raising the current 77% subsidy to tuition costs that comes from scholarship funds can be maintained, the Academy might well stand on its own. And we have not mentioned the possibility of adding women players in some fashion. At the Open House it was clear that Mr. Graham has done some preliminary thinking about that. Tim – awesome stuff here, thank you! I didn’t do any additional research beyond the cited article, so my comment was simply meant to highlight that while the article seems to portray the academy as having a dual soccer/academics mission, the ‘precise definition’ given by the author forces an addendum that basically says, ‘OK, the mission is officially about only soccer, but nobody acts like that.’ So it sorta makes the opposite point. So I didn’t mean to cast doubt on the academy’s academic bona fides, just to point out that it’s odd to point us to the precise definition of the mission, then add some stuff to make that definition fit the narrative of the article. Mr. Graham was educated at Dartmouth if I understand properly. He also understands I imagine that the professional landscape is not yet sown – so in the meantime YSC Academy educates kids to the highest level, sends them off to USL or excellent colleges and either those kids then: become different (worker bee) professionals or still matriculate back to MLS through the draft if good enough in 4 years… until that path is or is not viable. I really have to imagine so much of this plan at its fullest fruition comes back to solidarity and training comp… if in ten years the league grows and the levels below the top level grow and the US truly begins developing World Class level players (which is the stated mission by Tab Ramos in the most recent TopDrawerSoccer article) maybe a Matt Real fetches a few million on the market… at which point some of the money filters back to Academy: both soccer specific and YSC High School. Who knows. At this point the High School is college prep… but if America is heading in the direction it hopes and states it intends to head with soccer… these kids will should hopefully have a market value to sell. What is interesting to me… is if your not selling abroad, with only 24 MLS Top Teams all with their own academy- who’s going to buy in a closed system… which leads to the further point, I guess about selling them overseas, which then strangely undercuts the mission of US Soccer about developing World Class players in the states. Such a paradox. Or is it just me? Citizen – this was a very interesting read. Definitely raises some questions the article could’ve covered, too. Good locker room atmosphere? Makes you wonder what Simpson’s been through. Regardless, welcome Jay. Spot on, that was a terrible way to structure his article. I found myself getting irritated by it rather than focusing on the content. Set up a list of targets…go sign every single one of them. Not a bad offseason. On paper. I’m optimistic, but let’s see these guys on the field now. Still some roster moves left to happen. Najem puts the roster at 28/28 and still no third keeper.